Autoplay is an option that appears on the screen when the user plugs a removable device such as a USB flash drive or hard drive into your computer. There are lots of reasons that affect the Autoplay option in Windows systems. Some solutions are given below based on the OS, apply them and get rid of autoplay not working in Windows computers/laptops. 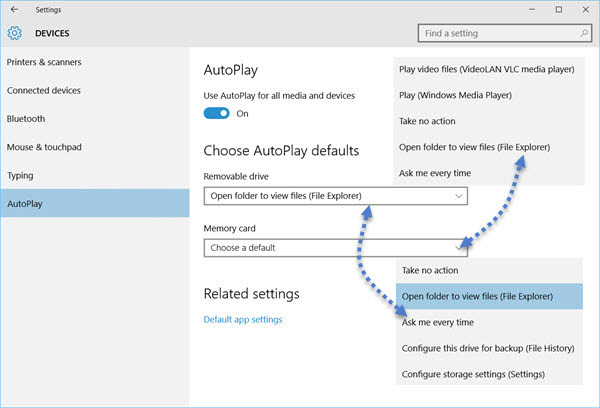 In Windows 10 you can enable or disable and set AutoPlay defaults easily with the help of Settings app. Go to the Settings app -> click on Devices -> Choose AutoPlay from the left side. To enable AutoPlay option you have to set the Use AutoPlay for all media and devices button to on. After it, you can select and set your AutoPlay defaults. After selecting your desired option, exit from the window. The above-given solution is effective and can make you able to fix the issue related to Autoplay in Windows 10. Step 1: Open the control panel. To do this, go to the search option (press the Windows Key + S) and search for the control panel. After it, choose Control Panel from the result. Step 2: After it, click on the AutoPlay. Step 3: In the AutoPlay settings, you have to check Use AutoPlay for all media and devices. Step 4: After it, click on the Reset all defaults button. It is suggested that Autoplay settings must be reset to the default. After it, check if Autoplay is working again or not. Step 1: Open the Settings, to do this, press the Windows Key + I and then click on the Devices. Step 2: Here, on the side menu you have to select AutoPlay. Step 3: Turn on the toggle present under Autoplay to enable it. Step 4: Now, you have to alter the value of the Choose AutoPlay defaults according to your requirement and exit from the window. Restart your PC to save these changes. Step 1: First you have to open the registry editor window, to do this press the Windows Key + R and in the run dialogue box type regedit and press the Enter key. This will open up the Registry Editor. Step 3: You need to confirm that the Explorer is highlighted in the left window pane and then click on the NoDriveTypeAutoRun which is present in the right window pane. Step 4: In case, the above-given value doesn’t exist then you have to create one. To do this, move the mouse pointer to the right window pane and then, right-click in the empty area and choose New > DWORD (32-bit) value. Step 5: You have to name the newly created key as NoDriveTypeAutoRun and then double-click on it to alter its value. Step 6: Here, you need to confirm that the hexadecimal is selected and in Value data field enter 91 then click OK. Step 7: Now, navigate to the given registry Key and follow the steps 3 to Step 6. Step 8: Close the Registry Editor and reboot your PC to save changes. Open the run dialogue box (press Windows + R) and in the run box type services.msc then click ok. In the Service Window, you have to scroll down till you find Shell Hardware Detection service. After finding, right-click on it and choose Properties. Set the Startup type to Automatic and if the service is not running, click Start. Click on the Apply and then OK. Restart your PC to save changes. Step 1: Open the Control Panel -> click on the AutoPlay icon. If you want to Turn Off AutoPlay completely: Uncheck the Use AutoPlay for all media and devices box present at the top. If you want to Turn off AutoPlay for Only One Device, Media, or Content: From the drop-down list next to the device, type of media, or content that you want to disable, click on the Take no action option. After it, click on the save button to apply. Reset the Autoplay options can be reset from the Control Panel. Open Control Panel -> Hardware and Sound -> AutoPlay or just Autoplay (for the classic view). Make sure that “Use Autoplay for media and devices” option is checked and also press the “Reset all defaults” button at the bottom, and click Save. Reset can be done on each drive letter itself and the Autoplay prompt may have been simply set to off for that drive. Remove all the Autoplaying device is plugged in -> Right click on My Computer click on the drive letter used by it -> Properties -> AutoPlay tab. Choose “Prompt me each time to choose an action” and click OK, or you can also click on the Restore Defaults button if present. If you want to fix Autoplay Not Working in Windows 10/ Windows 8 and Windows 7 then follow the given solutions one by one and check for the issue after applying each of them. [Solved] HOW TO FIX AMERICAN TRUCK SIMULATOR ERRORS: CRASH, LOW FPS, STEAM_API64.DLL IS MISSING ISSUE and MORE?